Evans is well known locally for having an encyclopedic knowledge of almost any climb in North Wales. Many-a-time he can be found in the bar at Plas y Brenin, waving his arms and legs wildly, telling willing listeners of the crux moves on their current project. Thankfully for Dave, those rock holds have not changed in millennia (routes on the slate or the Lleyn notwithstanding!) Outdoor routes see climbers perform the same moves now as in the very first ascent, sometimes many decades before. And as such, outdoor rock climbing remains the antithesis of modern indoor climbing: fixed moves, subject to the latest weather conditions (and of course, they’re all one colour). For many years, one indoor climbing wall that somewhat reflected this static nature could be found tucked away neatly in Capel Curig, at Plas y Brenin. Originally installed in 1993 and opened by the legendary Pat Littlejohn, this wall incorporated both new multicolour resin holds, bolted in place, with fixed features in the panels themselves. With this combination, it was possible to set new and exciting routes and still have marked feature routes on the wall that would remain forever. 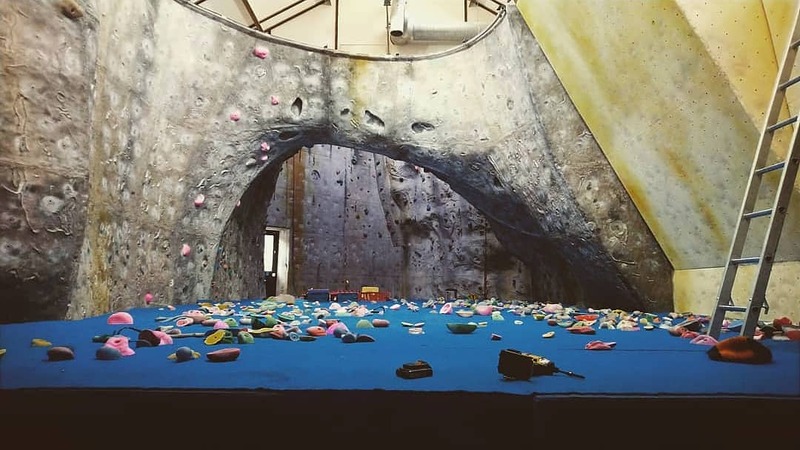 However, while state of the art in the mid-90s, resin walls are now outdated; most making way for a new breed of indoor climber, focused on the competition circuits and training and less interested in replicating real rock projects, requiring flat panels with more scope for creativity. Times change. For us, there is huge excitement for this new development. The idea is a bright, open and adaptable climbing wall, fit for purpose, and a facility that will be a point of pride for the Brenin. No doubt however, there will be sadness at the loss of our old resin friend. Many a strong climber over the years has plied their trade on this legendary circuit, from new climbers training their footwork ready to move outdoors to climbers operating well into the 8th grade, the old Brenin wall has been a major feature of the local community for so long that it would be impossible to see it leave without a tear in the eye. Resident storeman Jimbob Derry, who possibly started work at PYB back when it was still a Victorian coach house, often fondly tells tales of wads such as Chris Davies and Chris Naylor, who would wander down in his clogs and chef whites to test himself on his projects every now and again and see if he needed to train again. Finish the route and he’d be up to the bar, but fail, and he’d be back down the wall to get himself up to scratch. As time wears on and resin walls have become fewer and further between, the secret symbols become almost mythical to visitors. Small apples and lightning bolts, rune-like to the uninitiated, mark what are actually graded climbs, the symbols marking the featured holds permitted for individual routes. For many, the crux is merely opting to give them a try. The resin paneling will soon be removed and replaced with painted and textured plywood in a more up-to-date and modern wall. It is a natural progression and a classic modernisation that will vastly improve the potential for wall users. Flat panels allow for many more routes, and an augmented systems board has been planned to ensure a steady progression for any regular climber. It is certainly progress; but that should not stop us looking back fondly and feeling a hint of sadness at the loss of our old friend. For those of us with a knowledge of the history and heritage of the Brenin resin wall, the first time we walk in and see it gone will be a time of excitement and sorrow. Our job now is to take the shine off the new walls; to match the emotion that those small incut holds conveyed with new marks and new smudges. The bar is set high but as with any climb, that just makes the challenge all the better.